Marvel at the richness of culture and picturesque nature of Banyuwangi, the Sunrise of Java. Meet the Osing Tribe of Kemiren Village, who are still eagerly preserving their ancestor's elaborate tradition and rituals. The history of Kemiren dated way back to the time of the fallen days of Majapahit Kingdom. Where many of the population fled to various region to start a new life. The ancestors of the Osing then resides in the eastern part of Java named Banyuwangi and promptly established the Blambangan Kingdom. They declined to move back to Majapahit, and therefore named as the "Osing" people, which in their language means "no”. After 200 years of glory, the Hindu Buddhist culture of Blambangan then overthrown by the rapid growth of Islam, which led to the new reign of the Islamic Mataram Kingdom. During the independence war in the 1800s, Cungking village was where the Osing people originally dwells, but Cungking was gradually abandoned as people were running away from the Dutch troops to a densely forested area nearby. There were so many Kemiri and Duren (Durian) trees growing on the thick forest, that soon became their new home. They settle down and named their village after both trees, Kemiri-Duren merged as Kemiren. As descendants of a multicultural past, the Osing developed an interestingly different customs and language sets from its neighboring Javanese, Maduranese and Balinese people. They even have a fascinating set of tone in order to convey respectfull communication with the elders, or a more casual tone to address their peers. Kemiren's Chief of Tradition describe that back in the early days, every family have three kinds of houses built to serve several functions. The two-sided roof or Rumah Crocogan is the forefront used to welcome guests. The four-sided roof is named the Tikel Balung, housing the family room and bedrooms. There was no partition in original Osing homes. Mattrasses was only covered with sheer veil for privacy. The three-sided roof named the Baresan is located in the back as kitchen. The Osing’s entrance are usually ornamented with wood carvings of certain pattern, such as the Kawung. Cinde Sutro as the only place where you can find collections of priceless batik and weaves made of natural cotton, dyed with plants. The weaves were exceptionally special due to the fact that no one can produce more of them today. The weave is carried through three stages of their life, holding them as a baby, included in their wedding procession, and to carry the tomb stones to their graveyard. 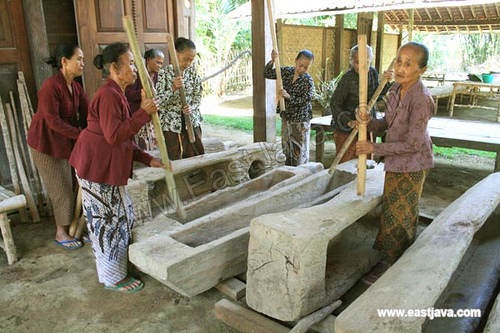 The Osing's batik patterns are picked from their agricultural surroundings. Wader Kesit from fishes living in rivers, Jajan Sebarong derived from image of bamboos, Kangkung Setingkes is the local vegetables, and Kopi Pecah for their long history with coffee beans . The basic dark-neutral sogan colors are the beautiful results of multiple dying process with secang woods and mango leaves, a collector must have items of Kemiren culture. Their iconic performance is The Jejer Gandrung — a dance escorted by a musical serenade called Gending Padha Nonton. You'll surely be fascinated by the vibrant colors of their elaborate costumes! Be inspired with the unique sound of Angklung Paglak, originally perform on 3 meters above the ground! Lesung Musical is another wonderful traditional tune composed to a genuine masterpiece of the Osing to celebrate their abundance in life. One of the signature festival widely anticipated in Kemiren is the Barong Ider Bumi, performed as cleansing rituals to repel negative influences such as evil spirits, disease, pest and anything that can disrupt the wellbeing of the villagers. And while you’re in Kemiren, do not forget to try their finest local coffee product, traditionally processed and brew to splurge all your senses! Can you smell that alluring aroma yet? It is strategically located on your way to the splendor of the eternal blue fire of Ijen Crater. From Jakarta and Surabaya, flights are now available for three routes per day to Banyuwangi. It will take around 40 minute’s drive from Blimbingsari Airport, and you can get to Desa Wisata Osing in Kemiren by rental cars with local guides. The main road connects this village with Banyuwangi in the east and Tamansuruh Bathing Area with Kalibendo Garden at its west end. Comfortable homestays are available for visitors longing to experience an authentic living among the Osing's daily live in Kemiren village. You are advised to make arrangement and confirmation before arriving, especially on the price, facilities and availability to smoothen your itinerary. They also provide special package for local foods, activities and certain festival that you can ask to be included for the complete experience of the many splendor in Kemiren.